Armstrong: Is Brind'Amour the answer for Hurricanes? The Carolina Hurricanes have hired former Hurricanes captain and Stanley Cup winner Rod Brind'Amour as the team's next head coach. RALEIGH, NC (WTVD) -- As I tweeted earlier today, there is no doubt that when it comes to the Hurricanes, Rod Brind'Amour is the man. There will never be a more iconic image than his face in that impossibly elated grimace as he raised the Stanley Cup over his head, skates stomping gleefully into the ice in 2006. It's likely a statue someday. In fact, I'm a little surprised it's not already. That image is canon for Canes fans; this will now be a separate story. Rod Brind'Amour as head coach. As a player, he was a legendary worker. While very skilled, there wasn't much glamour to Brind'Amour's game. He was smart, he was prepared and he was impossibly fit. The first two of those characteristics should serve him well as a coach, the third should serve his players well. An example of what's necessary to max out your abilities. The work that's necessary, each and every day. 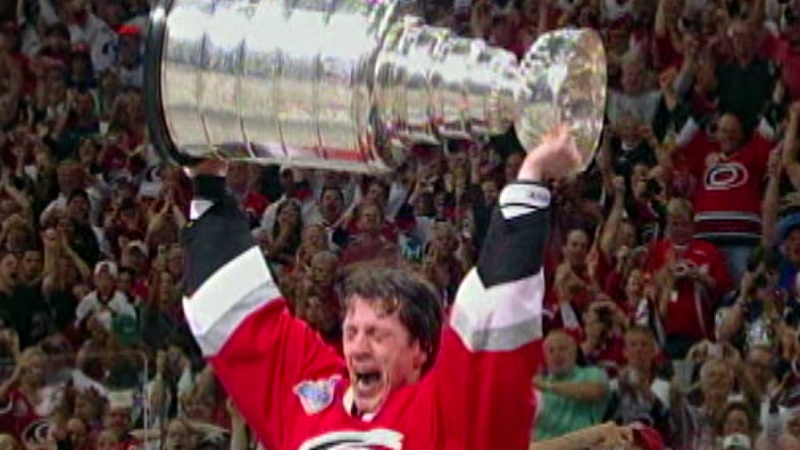 As a captain, Brind'Amour wasn't a screamer. He was measured, building connections with each of his teammates. He led by example, and only when necessary, led with his words. There's rightfully some concern about Brind'Amour failing in his first shot at being a head coach. Failing with the hometown team. Nothing is certain in this game. The reactions from those who know him though have been uniformly glowing. From Mike Commodore to Erik Cole to Jordan Staal and Justin Williams, all are certain Brind'Amour will command the room from the jump on reputation alone. What he does with that command will determine his success or failure. Unsurprisingly, the view from inside PNC Arena is also celebratory. The greatest captain in Hurricanes history will now attempt to become a coaching savior. The one to lead the team, and in a couple cases, his former teammates out of the desert of 9 long, often ugly playoff-free seasons. His leadership credentials are impeccable, even if his coaching resume is not. Seven seasons as an assistant under Kirk Muller and then Bill Peters doesn't give us any real idea of how he'll perform as the head coach. That journey starts tomorrow.